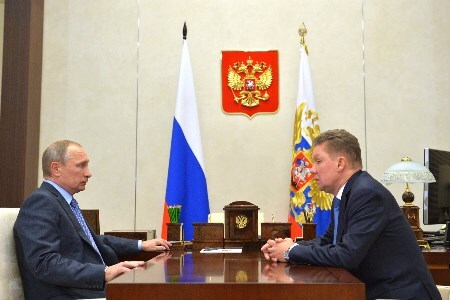 A working meeting between Vladimir Putin, President of the Russian Federation, and Alexey Miller, Chairman of the Gazprom Management Committee, took place on 24 October. Alexey Miller briefed Vladimir Putin on the readiness of Russia’s Unified Gas Supply System for operation in the 2016 - 2017 autumn/winter period, focusing on reserves accumulation in underground gas storage facilities. The meeting also touched upon the prospects of the TurkStream project. Vladimir Putin: Mr. Miller, we often meet on various occasions, but today I would like to discuss a topic that has particular relevance for our country, since we live in the north: I am referring to the preparations for the winter period. The bulk of work has already been performed; in many regions it is time to turn on the heating systems, and we know how heavy the load is on energy utilities at this time, especially on energy majors. What has Gazprom done to prepare for all that? Alexey Miller: Mr. Putin, Gazprom has completed the process of injecting gas into underground storage facilities, as we have reached this year’s target. The amount of underground gas reserves for the upcoming winter is 72.1 billion m3. I would like to note that in the past five years we have purposefully worked to increase the daily deliverability of our underground storage facilities. It’s gone up 22% over the five years. By the start of the withdrawal period – as the autumn/winter season begins – the daily deliverability of our ‘undergrounds’ will reach 801 million m3. That’s a record-high for our gas industry, the largest figure in its history. We have completed 16 sets of preventive maintenance operations to prepare for the winter, all of them successful. I can therefore attest that the Unified Gas Supply System is ready for the autumn/winter period. Vladimir Putin: Excellent. You have also signed contracts with thermal power stations, haven’t you? Alexey Miller: Yes, we have. Vladimir Putin: Is everything all right? Any problems? Alexey Miller: There aren’t any problems. We will secure power supplies during the peak heating period. Vladimir Putin: Very good. Just recently, an agreement was signed in Turkey, which is highly important for the company. How do you assess its prospects? Alexey Miller: The Intergovernmental Agreement provides for the construction of two offshore strings across the Black Sea to Turkey, with the capacity of 31.5 billion m3 of gas. Both strings are scheduled for completion by late 2019. As you know, Mr. Putin, as a result of our preparatory work we have already, even before the end of 2016, built in Russia the entire gas transmission infrastructure needed for feeding gas into the offshore gas pipeline. Besides, our Turkish colleagues have confirmed all the permits and documents that were developed for building South Stream within the Turkish economic zone. The Turkish authorities have confirmed that all those permits are valid for TurkStream as well. We have already received a survey permit for the pipeline section within the Turkish economic zone in the Black Sea, covering 250 km from the border between the Turkish and Bulgarian economic zones toward Turkey. All this allows us to say with confidence that both strings will be built as scheduled before the end of 2019. As you know, the first string with the capacity of 15.75 billion m3 of gas is intended for Turkish consumers, while the second string will deliver gas to the European market. Accordingly, it is planned to create a transit infrastructure across Turkey toward European countries.